Winter is Coming! If you are a fan of the HBO series Game of Thrones, you immediately recognize the words of House Stark. If you have never seen or heard of Game of Thrones, you probably still get the reference. Fall is here and winter is right around the corner. It is time to start preparing your home – and your yard – for another cold, wet winter. Climate experts at the National Oceanic and Atmospheric Administration are predicting another harsh winter here in the Baltimore area. And the Farmer’s Almanac agrees, calling for a cold, wet winter, capped with lots of snowfall. Are you ready? More importantly, is your home ready? Now what about your yard? While many homeowners will spend the fall season preparing the inside of their home for winter, few take the time to properly protect items like their wood fence. Falls is the perfect time to prepare your wood fence for the coming season. After all, wood and water are not exactly the best of friends. 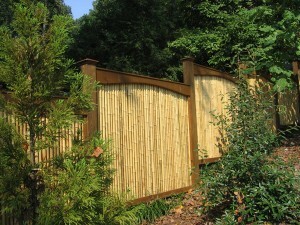 So it is important to protect your fence against excess moisture, especially with another snowy winter on the way. Before doing anything else, give your wood fence a proper cleaning. You can do this with a hose or a pressure washer. Simply use the water pressure to remove any dirt and debris. Just be careful not to damage the wood. Once your fence is clean, you should inspect it for any signs of damage. If you find anything, repair it as soon as possible. As the saying goes, a stitch in time saves nine. While the saying is not about fencing, the basic principles still apply. Timely maintenance will prevent small issues from becoming major catastrophes in the future. Now is the time to really get to work. With time and exposure to the weather, wood will begin to decompose if not properly protected. You must stain and seal your wood fence AT LEAST every three years. During the fall and winter, remove debris, such as leaves, snow, and fallen branches, from around your fence. It is also smart to trim any branches that may be hanging over your fence. When it snows, snow adds extra weight to these branches, which could cause the limbs to snap and damage your fence. Mid-Atlantic Deck and Fence offers many different styles of standard wood fencing as well as custom designed wood fences. And because we purchase most of our wood by the truck load it gives us the ability to offer you a high quality product without the high quality price tag. That’s what we like to call a win-win! If you have any questions about, please contact Mid Atlantic Deck & Fence (MAD Fence) today by clicking here or calling 1-800-833-9310. You can also follow us on Facebook and Twitter as well.